Communicating anytime and anywhere, even when riding your motorcycle: you can do that thanks to the N-Com modular communication system. Now, talking with your passenger, on your mobile phone or with other motorcycles, listening to music on your MP3, using a satellite navigator or the motorcycle audio system is simple and intuitive. N-Com systems are perfectly integrated in pre-set Nolan helmets, they are easy to install, and ensure high levels of comfort and practical use. Audio quality is excellent, conversations are clear and pleasant even when riding at top speeds. The N-Com wide range of accessories satisfies the needs of the most demanding bikers: you can connect via cable to various audio devices and recharge your N-Com Kit even while travelling. Do you want to buy a new helmet? N-Com products follow you! Thanks to the pre-setting featured by Nolan helmets, N-Com kits can be transferred onto different helmet models. 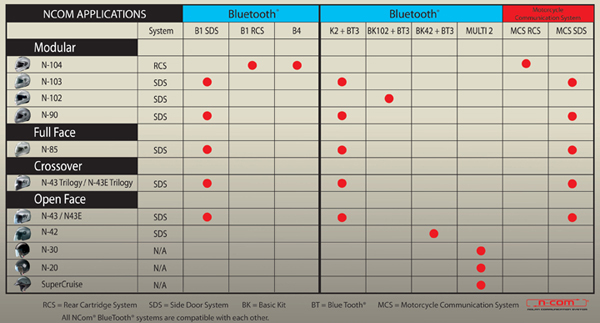 You can also connect kits of the N-Com, X-Series and MULTI lines in intercom mode, for maximum freedom. Safety above all: all Nolan helmets pre-set for the N-Com system are type-approved with the communication system installed, consequently they comply with regulation ECE/ONU 22-05.